St Louis PhotoReal Scenery. This is high resolution, 1 meter/pixel, terrain scenery for St Louis, Missouri (MO). This package includes all of the 30 files in one easy to download zip. A map and decriptions show the section locatons and some feature details. This photoscenery is for DAY USE ONLY and will work for any season, but shows only the USGS aerial photo data taken in March 2002. The default FSX mesh works well with this photoscenery and no additional mesh for the area needs to be purchased. The 30 sections of scenery, totaling 2 Gb, contains photoreal terrain textures, encompassing an area bounded by 31.7 E-W and 27.4 N-S miles (about 870 square miles). Each section is independant, but the user may want most or all sections to provide continutiy and completeness. By Jim Jones. Section A - St Louis Photoreal Scenery. This is high resolution, 1Meter/Pixel, terrain scenery for St Louis Missouri for Section A, see details below. This photoscenery is for DAY USE ONLY and will work for any season, although the source is from USGS aerial photos taken in March 2002 and shows only that season. The resolution of this scenery is 1 meter/pixel. Photoscenery areas prevent autogen scenery from appearing within the photoscenery area, but autogen will appear outside the photoscenery area. The default FSX mesh works well with this photoscenery and no additional mesh for the area needs to be purchased. I have no plans to create 1M seasonal or night scenery. If the 1M scenery is active at night the default FSX night scenery terrain scenery will not show. The 30 downloads of scenery contains photoreal terrain textures for St Louis, encompassing an area bounded by 31.7 E-W and 27.4 N-S miles (about 870 square miles). No new objects have been added and none have been removed. So, misplaced or misligned objects placed in the original FSX scenery remain as is. Main FSX highways, large airport runways and rivers match well with the photoscenery. FSX minor roads, taxiways and building placement match less well. Refer to the photo named StLouisMap.jpg to see what is included in each download. The following shows a list of the 30 downloads and a brief comment for some their contents. Some larger communities include: St Charles, Maryland Heights, Hazelwood, Florissant, Ferguson, University City, Kirkwood, Webster Grove, Afton, Concorde and Mehlville. The textures cover the rivers and lakes with their natural color. Consequently, these textures will not show reflections or other water effects such as wakes by float planes and boats. The lakes have not been processed to act like water, so boats and floatplanes will not provide water effects. For the first section that is installed, create in a location of your choice a folder named StLX1M. Create two subfolders named Documentation and Scenery. Note: There is not a Texture folder since the BGL files contain the textures within them. Note that the text document is nearly identical for each section thus only one section's text files is recommended to be saved. The jpg file is different for each section. The purpose of this is to have all the BGL files in one scenery folder. This allows having to activate only one scenery folder. 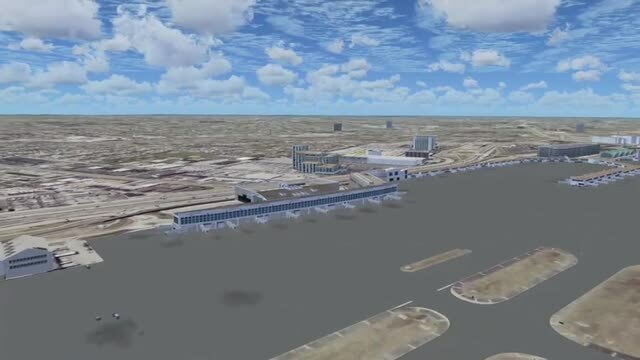 Activate only once, the StLX1M scenery, through the FSX Scenery Library. FPS is a very important adjustment. If set too high the textures will not appear sharp. Phototextures are usually presented by FSX at startup in its highest resolution. If you go too fast, if the Target FPS is too high, or you do a lot of panning in or out of the A/C the terrain will go to a lower blurry resolution. In time the blurry terrain will improve ahead of your view. If not you need to set your FPS target lower, or fly slower or stop panning your view -- or all of these. The amount of non terrain scenery and panel also has an effect. You may wish to view with no panel at all. I get the best result using the Trike at low speeds, with an exterior view above and behind, zoomed out and looking almost directly below. That is where FSX seems to generate the highest resoution terrain first. EVGA GeForce G8800 GTS 640 Mb PCI-E: Two WDC 500 Gb SATA II, 3 Gb/s 16 Mb Cache, 7200 RPM: CL SB X-FI XtremeGamer: Sony 18X DVD+-RW Dual: 16X DVD ROM: Coolmaster 600w PS: Thermaltake Maxorb CPU fan: NZXT Case w/6 Fans: Vista Home Premium (sp1) 32 bit. Microsoft for providing the flight simulator and their continuing improvement of the software and SDK tools. To Terraserver and USGS for their photoscenery data. To Doug Cox for his USAPhotoMaps program to extract Terraserver data and produce BIG jpeg files. To Scott Gridley for direction to the DGWarp tool to convert from Terraserver UTM projection bitmaps to WGS84 projection in GeoTiff format for input to the FSX SDK Resample program. This is freeware and is not to be distributed for any monetary gain. The author of this scenery is not responsible for any problems you may encounter with your system or other files as a result of using the programs provided here. The archive stlx1m.zip has 43 files and directories contained within it. Despite being a game with an incredible dedication to realism and attention to detail, it can be a bit of an issue when you first start using FSX as it includes practically the whole world. This means that all of that attention to detail on the aircraft is shown up by the rather default looking environments below. Thankfully, the absolutely insane community that builds so much content for flight simulators ensures that you have all the help that you need in setting up a traditionally excellent looking world that feels far more realistic. My own FSX is loaded to the brim with new textures and features – and it really does make the world look so much better. This package, in particular, is designed to stunning detail and realism. It gives you the whole St Louis area in a photorealistic environment, meaning that everything you fly over will no longer be a poor placeholder or default style of terrain – it will represent the area underneath you perfectly. With 30 unique sections included in this package, you’ll get a truly staggering change to the area below and make sure that when you fly over St Louis you’ll be able to point out just about everything! Covering an area roughly 870 square miles in length, I have to say just how impressed I was at the attention to detail. There was no holding back with this design quality, as it ensured that the entire project looked exactly as it was supposed to – there’s a real accuracy with the placement of each area, too, so you’ll find that the attention to detail and precision matches the quality of the pictures below. The huge quality of resolution in every single section makes this stand out so much more than the traditional world of FSX – you’ll really be able to tell every part of the region out from below without having to do a double take. For a lot of people, myself included, the lack of detail within the vanilla FSX experience is a massive letdown and can take away from how engrossed you’ll be getting in the actual world. With this package, though, you can leave those doubts behind. This really makes the entire place look absolutely bouncing, and adds a nice new layer of volume to the region that was sorely missing in the original release. Do you feel that no amount of graphical settings and autogen terrain is going to make the region feel real enough? Then you need to download this photoreal scenery package. It’s absolutely made for people who want to enjoy themselves and get something truly spectacular – I was massively impressed with the detail and the quality of the images. Other photo scenery packages elsewhere have lacked enough focus from location to location, but this feel as if it was all taken by the same camera and the same quality – it blends together expertly, and creates a truly remarkable version of the ST Louis area. I feel like I followed the readme correctly, but when I navigate to the folder when trying to activate the addon in the setting of FSX:SE its telling me there isn't any valid files. When I look at the folder from my desktop file explorer, all the BGL files are there. Not sure what to do.